The joint strength of the spiral was weak, and even if it was slightly stretched, the joint was detached and it became useless. This review is about item#16398752. We extended the outdoor ventilation duct. It was made of aluminum lightly and it was easy to fix. However, scratches are easily attached, so caution is required at the time of construction. I will not bend more than I thought. Regarding elongation, it is difficult to return it if it stretches out "It is not an application that grows and shrinks". Also, it was quite bigger than the exhaust port of the spot Kura, it was filled with tape and fixed. Well, because it is cheap, I will not complain. . . But exhaust of the spot cooler has become able to escape ★ ★ ★. Spot air conditioner Since we did not have an exhaust duct when purchasing it, I'm thinking about attaching this. This review is about item#32728062. It's easy and cheap, is not it? . . . . . . . . . . . . . . . . . . . . . . . . . . . . . . . . . . . . . . . . . . . I purchased it by mistake in diameter, I devise it and use it. Bending and elongation are good, I am satisfied. 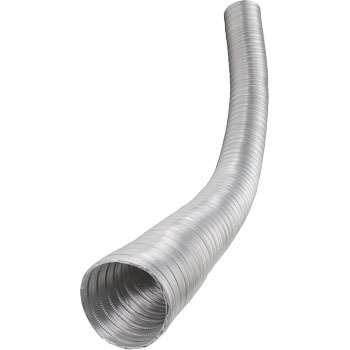 Purchase this because the manufacturer's original exhaust extension duct was expensive. Handling, construction was easy, quality was not problem. Impression with this flex is bent wonderfully. And you can lengthen or shorten the length of the flex. And installation time is fast. This review is about item#32728053. It was light, durable, beautiful and very good thing. Curves also supple. It is solid and easy to handle.